Thursday, November 8, 1838.Jacksonville, IL. Friday, November 8, 1839.Springfield, IL. 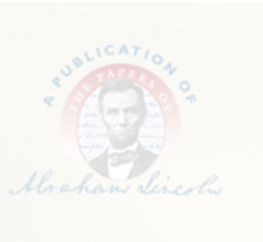 Lincoln writes article published in "Sangamo Journal" on history of state bank at Springfield. He replies to several critical articles in "Illinois State Register," saying bank is not solely Whig institution, but was advocated by many Democrats, including Gen. Ewing, Senator Will, Judge Theophilus Smith, Col. J. A. McClernand, and Col. J. Fry. He writes notice (published December 5, 1839) for complainant, David Bruner, in case of petition for partition of real estate in Bruner v. Bruner et al., that affidavits of nonresidents in case must be filed before trial at May term of Tazewell Circuit Court.Sangamo Journal, 8 November 1839, 5 December 1839. Monday, November 8, 1841.Petersburg, IL. Menard Circuit Court opens three-day session. Logan and Lincoln represent plaintiff in Purkapile v. Hornbuckle, replevin suit concerning gelding. Case is continued. Lincoln obtains leave to amend transcript in Trent v. Taylor. In Elmore v. Bale, Lincoln as attorney for plaintiff asks court to issue attachment against Mentor Graham for contempt in failing to attend as witness.Record. Wednesday, November 8, 1843.Petersburg, IL. Jury awards plaintiff $33.70 in White & Williams v. Baxter. Jury is sworn in Miles & McCoy v. Merrill, and Lincoln, attorney for plaintiffs, dismisses appeal. Petition to sell real estate in Wilcox v. Wilcox et al. is granted, and Lincoln, attorney for complainant, files his report. Injunction in Estep v. Wagoner et al. is made perpetual in sum of $14.62, Lincoln for complainant. Lincoln writes and files five affidavits, including his own, in Cabot v. Regnier, on basis of which Baker moves for new trial, which court grants, with change of venue to Morgan County.Record. Wednesday, November 8, 1848.Springfield, IL. Friday, November 8, 1850.Springfield, IL. Lincoln collects $25 retainer from state for future legal services in Compher et al. v. People. Illinois Reports, 1851. Saturday, November 8, 1851.Shelbyville, IL. Monday, November 8, 1852.Shelbyville, IL. Tuesday, November 8, 1853.Shelbyville, IL. Lincoln takes deposition of Anthony Thornton in Oldham & Hemingway suit. Deponent is "certain the defendant Lincoln has never had anything to do with the collection of the note of W. F. Thornton and Basye, debtors of Oldham, Todd & Co." William H. Townsend, Abraham Lincoln, Defendant: Lincoln's Most Interesting Lawsuit (Boston: Houghton Mifflin, 1923), 28-30. Wednesday, November 8, 1854.Springfield, IL and Clinton, IL. At daylight Lincoln leaves for Clinton, where special term of the DeWitt Circuit Court is held. Abraham Lincoln to Orville H. Browning, 12 November 1854, CW, 2:286-87. Thursday, November 8, 1855.Springfield, IL. In the Sangamon County Circuit Court, Lincoln files a declaration in the case of Pea v. Williams. Lincoln's client, Nancy J. Pea, is suing Greenberry Williams for a breach of marriage contract. Pea asserts that in August, Williams "faithfully promised . . . to marry" Pea on September 1. Instead, on October 1, Williams "wrongfully and injuriously married" another woman. Pea claims that Williams "fraudulently intend[ed] craftily and subtly to deceive and injure her." Pea seeks $2,000, in damages. Declaration, filed 8 November 1855, Pea v. Williams, Henry E. Huntington Library, San Marino, CA. Monday, November 8, 1858.Springfield, IL. Lincoln & Herndon win two cases in Sangamon Circuit Court. In Chamblin v. Springfield Marine & Fire Insurance jury finds for plaintiff, their client, and assesses his damages at $1,000. In Clinton v. Snow & Robbins, in which they also represent plaintiff, defendants withdraw plea and court assesses Clinton's damages at $205.88. Record. Lincoln writes letter of introduction to Horace Greeley for John G. Nicolay of Springfield, who "wishes an arrangement to correspond" for Greeley's paper. Abraham Lincoln to Horace Greeley, 8 November 1858, CW, 3:336. Thursday, November 8, 1860.Springfield, IL. Lincoln is still receiving felicitations. Local Republicans however, are somewhat concerned over legislature, returns being so incomplete as to leave Trumbull's re-election in doubt. N.Y. Tribune, 9 November 1860. Lincoln writes Hamlin that he is anxious for personal interview, and asks him to meet him in Chicago. Abraham Lincoln to Hannibal Hamlin, 8 November 1860, CW, 4:136. Friday, November 8, 1861.Washington, DC. Secretary of State William H. Seward presents Edward Count Piper, minister of Sweden and Norway, to President. National Republican (Washington, DC), 9 November 1861, 2:3; National Intelligencer (Washington, DC), 9 November 1861; Reply to Edward Count Piper, 8 November 1861, CW, 5:17-18. Charles F. Havelock, British officer appointed aide-de-camp to Gen. McClellan, November 23, 1861, calls on Lincoln. N.Y. Tribune, 9 November 1861; Abraham Lincoln to Edwin M. Stanton, 27 July 1863, CW, 6:351. President receives F. S. Asta Buruaga, Chilean minister, who announces inauguration of new President of Chile. N.Y. Times, 9 November 1861. In afternoon, along with General George B. McClellan, reviews General Don Carlos Buell's division of three brigades on Fourteenth Street Road beyond Columbian College. National Republican (Washington, DC), 9 November 1861, 2:4. Loans Thomas Stackpole, White House watchman, $380. Pratt, Personal Finances, 82. Saturday, November 8, 1862.Washington, DC. President writes: "I can very cheerfully say that Mr. Calvert has for some time been employed at the White-House, and has appeared to be a very faithful, worthy and gentlemanly young man." Recommendation for Mr. Calvert, 8 November 1862, CW, 5:491. Sunday, November 8, 1863.Washington, DC. A. Gardner photographs Lincoln. Frederick H. Meserve and Carl Sandburg, The Photographs of Abraham Lincoln (New York: Harcourt Brace, 1944), 8 November 1863. President is photographed with John Nicolay and John Hay. Dennett, Hay Diaries and Letters, 117. Replies to request of committee of merchants and citizens of New York: "I shall be happy to give the interview to the committee as you request." Abraham Lincoln to William B. Astor and Robert B. Roosevelt, 8 November 1863, CW, 7:4. Tuesday, November 8, 1864.Washington, DC. President interviews Mary E. Collins about special exchange of Capt. William A. Collins, Co. D, 10th Wisconsin Infantry. Abraham Lincoln to Ethan A. Hitchcock, 8 November 1864, CW, 8:95. Recognizes Teodoro Manara as consul of Republic of Guatemala at New York. Washington Chronicle, 11 November 1864. Tad discovers that soldiers quartered in White House grounds are voting for Lincoln and Johnson. Makes father go to window and watch. Noah Brooks, "Personal Reminiscences of Lincoln," Scribner's Monthly 15 (1877/1878):675. At noon Lincoln discusses election with Noah Brooks. Randall, Lincoln, 4:259. Receives from Carlos Pierce mammoth ox called "General Grant." Rice to Lincoln, 22 November 1864, Abraham Lincoln Papers, Library of Congress, Washington, DC; Abraham Lincoln to Alexander H. Rice, 8 November 1864, CW, 8:96-97. At 7 P.M. in rain President and John Hay go to Sec. Stanton 's office in War Dept. to receive election returns. Stanton and Sec. Welles, Asst. Secs. Fox and Dana, and others are present. During lull in telegraphic reports Lincoln reads aloud from writings of Nasby. Stanton expresses indignation at nonsense. At mid-night Maj. Eckert provides supper. Lincoln "shovels out fried oysters." During evening and night former Sec. Chase, Col. Eaton, Whitelaw Reid, correspondent for Cincinnati "Gazette," and others pay short visits. Hay, Letters and Diary; Charles A. Dana, Recollections of the Civil War. With the Leaders at Washington and in the Field in the Sixties (New York: Appleton, 1902), 261; Rufus R. Wilson, ed., Intimate Memories of Lincoln (Elmira, NY: Primavera Press, 1942), 577-78. "I have the honor to resign my commission as a Major General in the Army of the U.S.A., with the request that it may be accepted to take effect today. I am, sir, very respectfully, George B. McClellan." DNA—WR RG 94, Adjt. Gen. Off., Letters Received, M1250 (CB) 1864. Lincoln writes managing committee of Sailors' Fair in Boston: "Allow me to wish you a great success. . . . To all, from Rear Admiral, to honest Jack I tender the Nation's admiration and gratitude." Abraham Lincoln to the Managing Committee of the Sailors' Fair, 8 November 1864, CW, 8:95. Informs Sec. Seward at Auburn, N.Y.: "News from Grant, Sherman, Thomas and Rosecrans, satisfactory, but not important. Pirate Florida captured by the Wauchusetts [U.S.S. "Wachusett"] Oct. 7th. on coast of Brazil. The information is certain." Abraham Lincoln to William H. Seward, 8 November 1864, CW, 8:97.